Imagine for a moment that the ocean is one wet, massive high-school cafeteria. See that guy in the corner, eating his tray of krill and muttering kind of weirdly to himself? That’s Whale 52, the loneliest, horniest guy in school, filling the room with unheeded pleas for companionship and maybe a little action. And there in the center, chattering away with the carefree vibe of the cool kids, are the dolphins — and like any clique, they have their own codes and their own rules. 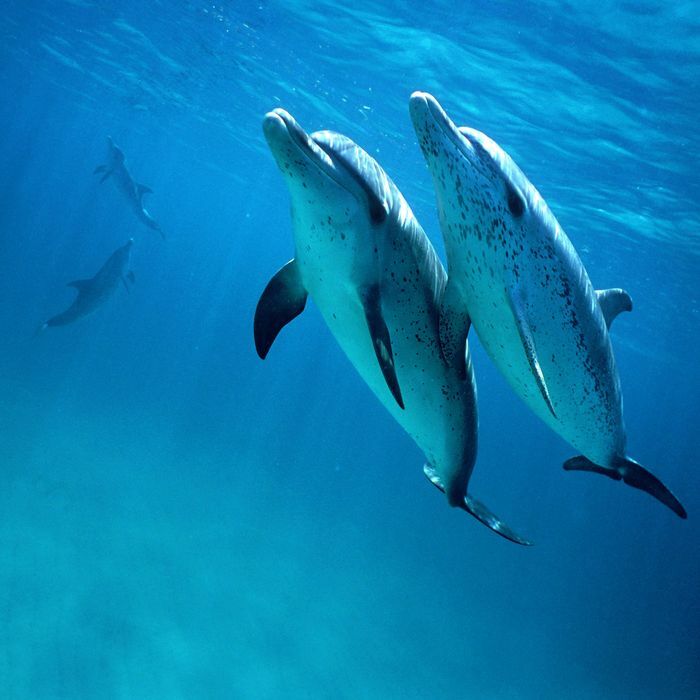 In fact, as New Scientist reported last week, dolphins have a special type of language they use to solve problems together. According to the Dolphin Communication Project, a research and conservation organization based in Port St. Lucie, Florida, dolphins make two kinds of clicks. The first, echolocation, is “not a form of communication, but rather a method of ‘seeing’ the world through sound” — a dolphin will click, wait for the sound to bounce back, and use that echo to make sense of its surroundings. Four of the dolphins couldn’t make heads or tails of the container, but the other two solved the puzzle together over several different rounds, each time in under a minute. One of the two also managed to solve it on his own over a longer period of time. During the trials when one dolphin opened the canister unaided, one or more of the other dolphins was present nearby, watching the task. On these occasions, there was no increase in chatter. The team concluded that the increased chatter during the joint canister opening was related to the task itself, and not to the presence of another dolphin. In other words, the researchers may not have known exactly what the dolphins were saying, but they knew what they were talking about. “This is the first time that we can say conclusively that dolphin vocalisations were used to solve a cooperative task,” researcher Holli Eskelinen, the study’s lead author, told New Scientist. But look, dolphins — if you’re so into problem-solving, maybe someone should take a stab solving an easy one and invite that poor whale to a party. Just saying.